Knick Knack Gallery opened its doors to the public on March 8, at Voertman’s Gallery. Curated by Betsey Gravatt, the exhibition showcased seven artists’ lives through objects that have a great deal of meaning to them but have been somewhat forgotten. Using knick knacks as the core center of the gallery, Gravatt put together a show that would not just reveal each artist’s lives but would also show a broad range of skills. Being an artist herself, Gravatt’s experience as showcasing her own work and being a showcaser helped guide her in the direction she wanted the show to go. Having assisted in multiple shows before, Gravatt was excited to curate Knick Knack on her own. One artist showcased in the exhibit is Augustine Cordero, a graduate from UNT with a Bachelor of Fine Arts. He oversees the Voertman’s Art Department and Gallery. Having known Betsey prior to the show, Cordero was approached by her to be a part of the Knick Knack Gallery. Cordero chose to use his childhood toys as the knick knacks for his pieces, specifically action figures. His decision to reflect back on his childhood memories allowed Cordero to give the toys new meaning and transform them into an installation that conveyed a message to society. Titled “Got to get Tough,” Codero exhibited a “perfect” male society view to further delve into the male stigma. Contrasting Cordero’s approach to Knick Knacks, Joshua Reyes, a 23-year-old student finishing up his degree in Painting and Drawing, went a different direction. Reyes was influenced by the simplicity of knick knacks and saw his past works as a collection of knick knacks. With that in mind, Reyes went about creating a whole piece from all his works. 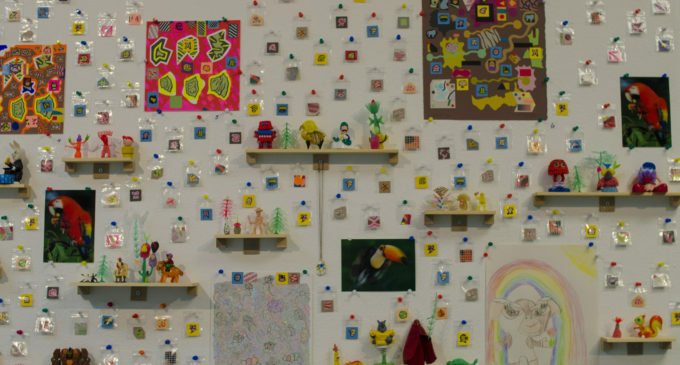 Gravatt’s goal to highlight the variety of artists that participated in the gallery was exemplified by the use of knick knacks because each individual artists had to come up with their own approach. “It was interesting to me that everyone worked in such different environments and put importance on different items,” Gravatt said. Lee saw Knick Knacks as the day-to-day objects she has laying around in her car. As an artist, Lee is constantly moving pieces to and from her car to shows. Using such objects, Lee created a collage that allowed her viewers to easily immerse themselves and therefore read into the piece. The variety of mediums used by each artist only brought them closer as a group, as they use each other’s strengths to gain more insight into their own artistry. Cordero added that finding knick knacks actually became more challenging than he had thought. He said it was also different because he tried to showcase a more personal struggle compared to creating “an almost selfless or ‘cool’ type of artwork. Gravatt said that each artist portraying something different was one of the things she loved most about the Knick Knack Gallery. The gallery showcased each artist’s talent and lives while also making viewers think about their own personal knick knacks. “I wanted to put all of these things that are usually kept private into a very public space, and give people more insight into these artists’ lives,” Gravatt said.